Radio emerged as the primary medium for the dissemination of music, advertisements, and news to the African American community during the 1940s and '50s. In Mississippi, the earliest radio stations to broadcast black music, usually in the form of local groups singing gospel or traditional harmonies live in the studios, included WQBC in Vicksburg, WGRM in Greenwood, and WJPC in Greenville. In the 1940s, Sonny Boy Williamson No. 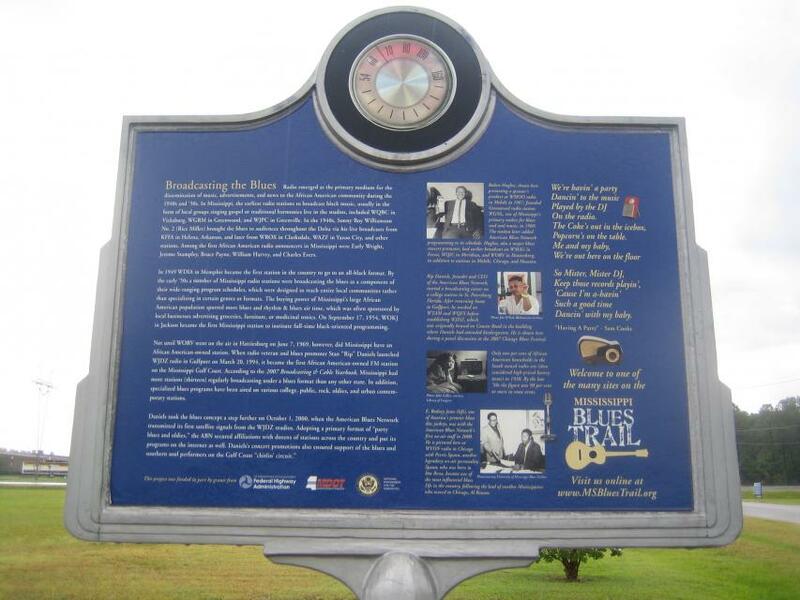 2 (Rice Miller) brought the blues to audiences throughout the Delta via his live broadcasts from KFFA in Helena, Arkansas, and later from WROX in Clarksdale, WAZF in Yazoo City, and other stations. Among the first African American radio announcers in Mississippi were Early Wright, Jerome Stampley, Bruce Payne, William Harvey, and Charles Evers. In 1949 WDIA in Memphis became the first station in the country to go to an all-black format. By the early '50s a number of Mississippi radio stations were broadcasting the blues as a component of their wide-ranging program schedules, which were designed to reach entire local communities rather than specializing in certain genres or formats. The buying power of Mississippi's large African American population spurred more blues and rhythm & blues air time, which was often sponsored by local businesses advertising groceries, furniture, or medicinal tonics. On September 17, 1954, WOKJ in Jackson became the first Mississippi station to institute full-time black-oriented programming. Not until WORV went on the air in Hattiesburg on June 7, 1969, however, did Mississippi have an African American-owned station. When radio veteran and blues promoter Stan "Rip" Daniels launched WJZD radio in Gulfport on March 20, 1994, it became the first African American-owned FM station on the Mississippi Gulf Coast. According to the 2007 Broadcasting & Cable Yearbook, Mississippi had more stations (thirteen) regularly broadcasting under a blues format than any other state. In addition, specialized blues programs have been aired on various college, public, rock, oldies, and urban contemporary stations. 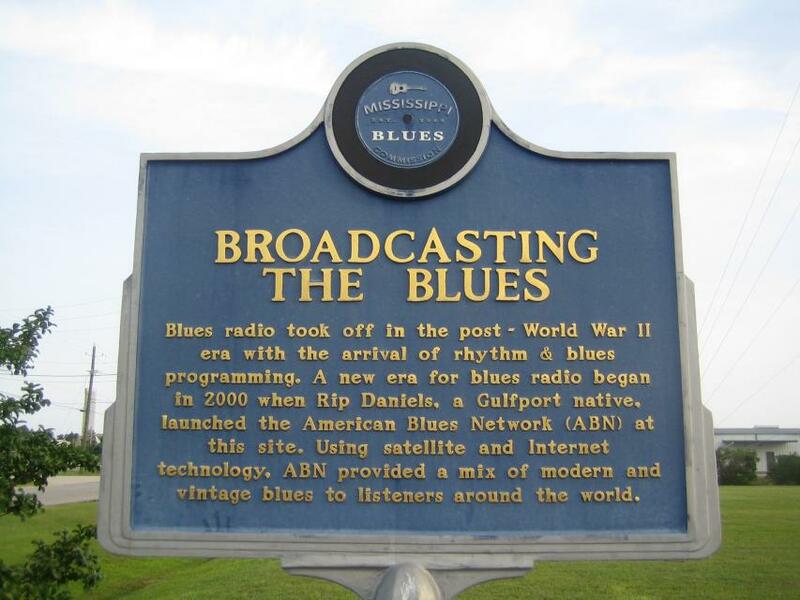 Daniels took the blues concept a step further on October 1, 2000, when the American Blues Network transmitted its first satellite signals from the WJZD studios. Adopting a primary format of "party blues and oldies," the ABN secured affiliations with dozens of stations across the country and put its programs on the internet as well. Daniels's concert promotions also ensured support of the blues and southern soul performers on the Gulf Coast "chitlin' circuit." This marker can also be identified by its HM code. You can use the hashtag #HM1J9P in tweets, and any other place where you might refer to this marker, including when searching on this site.